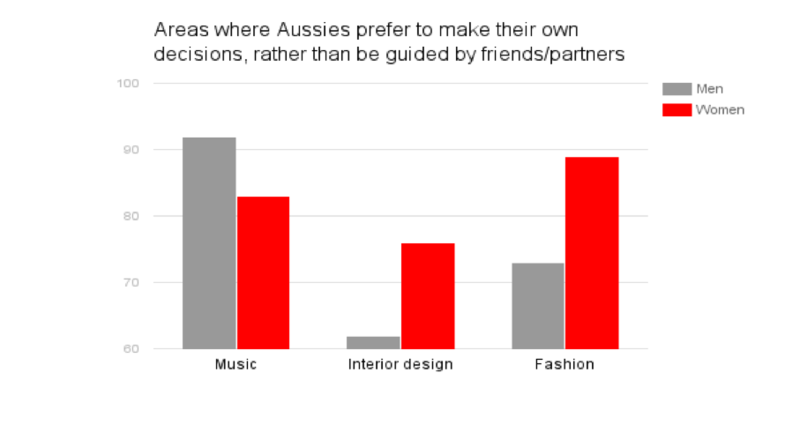 A new study by research firm YouGov has revealed that Australians think they have pretty good taste when it comes to things like food, fashion and music and prefer to make their own decisions rather than be guided by the likes of advertising, friends or family. YouGov polled 1000 Australians and found we’re most confident about their taste in food, with 63 per cent of those polled saying they have either “excellent” or “above average” taste in food. By contrast, people feel least confident about their fashion choices, with just 39 per cent of those polled saying they have either “excellent” or “above average” taste in fashion. Perceptions of taste are strongly linked to gender and largely conform to traditional gender stereotypes. Women are more self-assured of their fashion and interior design choices than men, with 18 per cent and 15 per cent of women describing their taste in fashion and interior design as “excellent” (compared with just 11 per cent of men in both area). Gender divides also extend beyond what the decision is about and factor into preferences over who makes the decision. Men are particularly protective when it comes to music, with over nine in ten (92 per cent) expressing a preference for making their own decisions rather than letting others make them, compared to 83 per cent of women. However, men are far more open-minded when it comes to interior design and fashion, with a much lower percentage (62 per cent and 73 per cent respectively) preferring to make their own decisions. By comparison, women are are far more protective over decisions in fashion, with 89 per cent prefer to make their own decisions. Confidence in one’s own taste also varies by region. Residents of NSW and the ACT are most assured of their fashion sense (45 per cent), whereas people in WA are far less likely to describe their taste in movie/TV as “excellent” or “above average”, with just 44 per cent confident that they have good taste in movie/TV compared to the all-state average of 58 per cent. Although not everyone thinks they have the best taste in all areas, few people believe that their taste is “below average” or “terrible”. The area where this is highest is interior design, with 17 per cent. But does taste even exist? More than half of women (56 per cent) believe that “the only thing that matters is whether I like something”. Men are less likely to subscribe to this view, with a majority (51 per cent) instead saying that “there is such thing as good taste”.